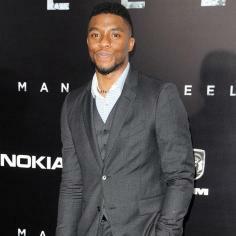 Chadwick Boseman is set to join 'Gods Of Egypt'. The 31-year-old actor has been cast in the epic fantasy film alongside Gerard Butler and Geoffrey Rush after landing the role of Thoth, the God of wisdom, according to Deadline. As well as directing, Alex Proyas penned the film's script with Burk Sharpless and Matt Sazamat. The story is set in ancient Egypt and sees Set (Butler) kill his brother Osiris, which leads to Horus (Nikolai Coster-Waldau) - the son of Osiris - team up with Hathor, the Goddess of love to seek revenge on his uncle. Rush will play the sun God, Ra, who is father to Butler's Set and the murdered Osiris. Meanwhile, Brenton Thwaites has been cast as Bek, a human thief who fails to care for Gods, but finds himself experiencing a change of heart when he discovers a woman named Zaya (Courtney Eaton) has been cursed. Filming for 'Gods of Egypt' will kick off later this year in Australia and is set for release on February 12, 2016.